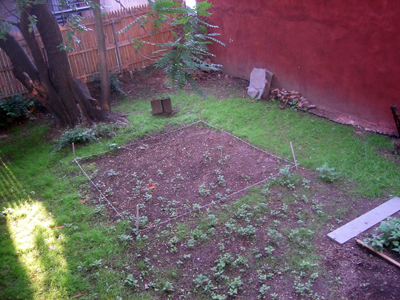 Deeded with the ground floor units of our new homes in Hoboken, NJ, Mike and I each split a back yard. 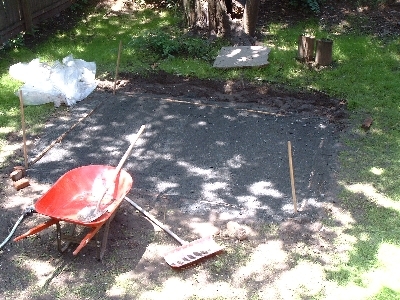 We decided that we wanted to place a 10′ x 10′ square foot patio in the center of the yard so that both units could split it, and still have grass on both sides (for darts or quates or horse shoes or whatever). I spoke with Andy the Fisch this week about the relaxation and sense of accomplishment that comes with doing yard work. My girlfriend scoffed at yardwork being relaxing, but this is the hottie who thinks running five miles is relaxing…so, I suppose you must always consider your source. Fisch’s response, however, was simply: “Sometimes you want to get your hands dirty.” Well, I couldn’t agree more. 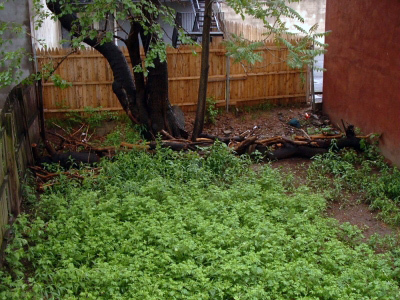 You wouldn’t believe how quickly the weeds sprung up between the inital offer and the move in. To make matters worse, the entire yard is covered with aphids (the ones that itch) and little white bugs. Thankfully, there were no nettles (Ask Tina about her trip to the Lake District in England) or thorn bushes. 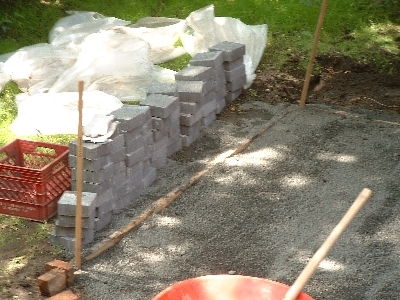 Well, the grass came in slowly and sparsely, like my dad’s comb-over, but Mike and I knew that we’d be lugging pavers, grit, sand and dirt through there for the rest of the project, so we didn’t worry too much. 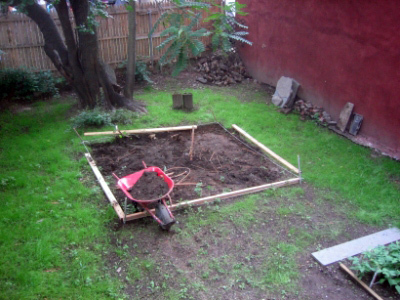 We marked a 10’x10′ square in the center of the yard, measuring from the edges to make sure we had equal sides on both, and that it wasn’t skewed with the framing fence and wall. We then put up stakes to try to get a better idea of if it would be big enough (or small enough) and look okay when we were done. Now I hate symmetry, but it’s hard to argue with a 50-50 split on property, so I let it slide for once. 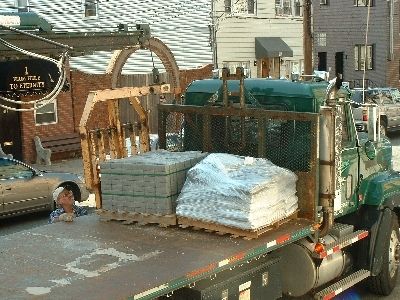 The truck came with two skids of materials. The gravel and stone-dust was on one and the paving stones were on the other. If you look real close, you can see Frank Sinatra’s birthplace on the other side of the street. 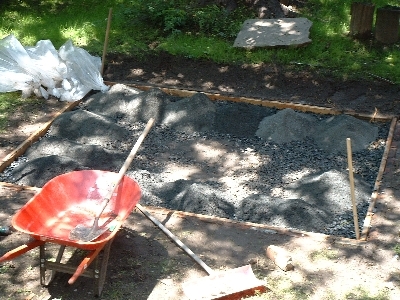 Mike filled the newly-dug foundation with gravel to help keep the stones even when we were done. 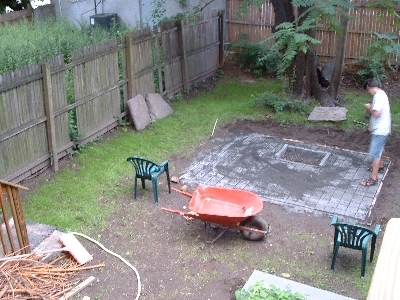 The gap in the center is for the fire pit. 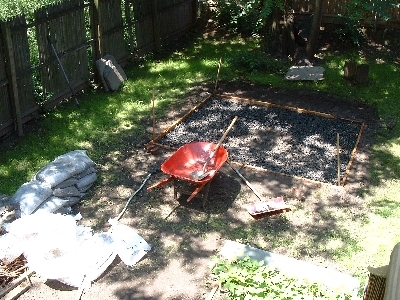 Then Mike put the stone dust on the flattened gravel, which would enable the pavers to sit level (sort of). 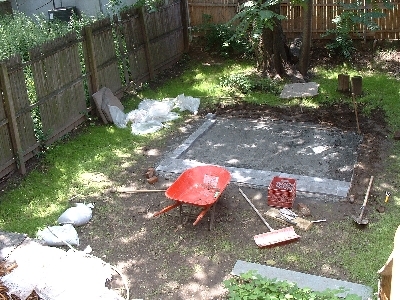 After it was leveled off, we double-checked the width and height to ensure the 6″ x 6″ stones would fit. …especially through a damp, dark basement with low ceilings. I suspect it’ll take two weeks before I can stand up straight again. 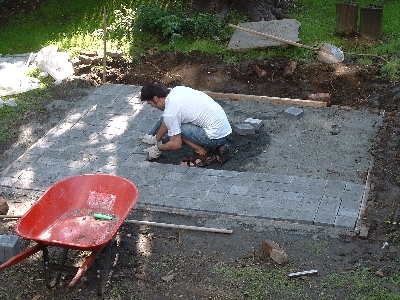 Mike then started from the outside, tiling the stones and checking that they were level (sort of). When I got back from a morning meeting, Mike was much in need of a break. Because the party was in two days (and we would’ve gotten a ticket if we left the skids on the street), we had to keep working until it was done. 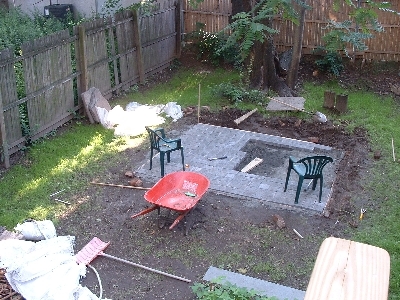 We had originally planned to have the firepit in the center around 2-1/2 feet, but it wouldn’t be centered if we chose an odd number. 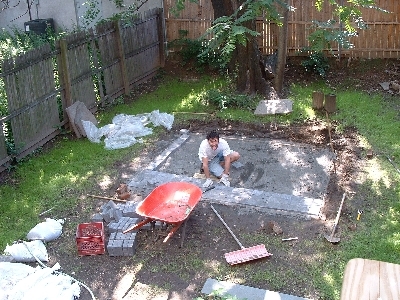 We decided to make it 2′, minus the width of the framing stones. 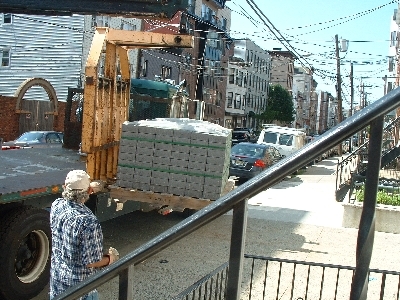 After all the stones were in, we spread remaining stone dust over the top and swept it in the cracks to lock the pavers in place. 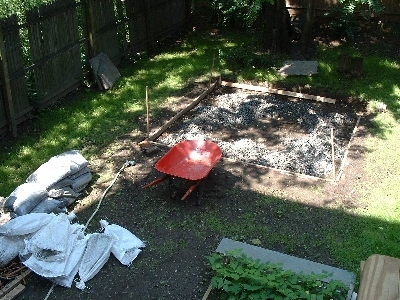 We then took the remaining dirt from the foundation to fill in the yard so it was more level as well. 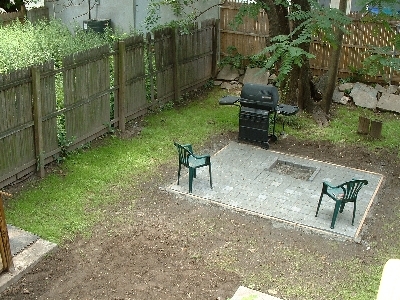 This weekend (after the housewarming party) we’ll lay new grass-seed to fill in the yard so its nice and purty. Of course we had to have a little party to celebrate the new patio (igore the copious product plugs…Coke and Bud aren’t paying for this placement). 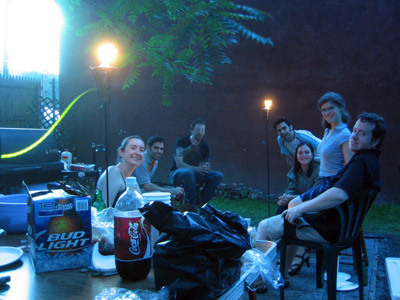 Katherine bought some sweet tiki torches for the housewarming which totally added to the overall appeal of the patio. Interesting side-note: That swoosh of green on the left is a lightening bug caught in the slow shutter of the camera…a true shutterbug. 🙂 Talk about a one-in-a-million shot.